So, I have been with the Post Office for a good five months now. On the whole things have been pretty good. I have no complaints really about either the service or the customer support, which for me has been first rate. There is one thing however I am having issues with and that is the supplied router. 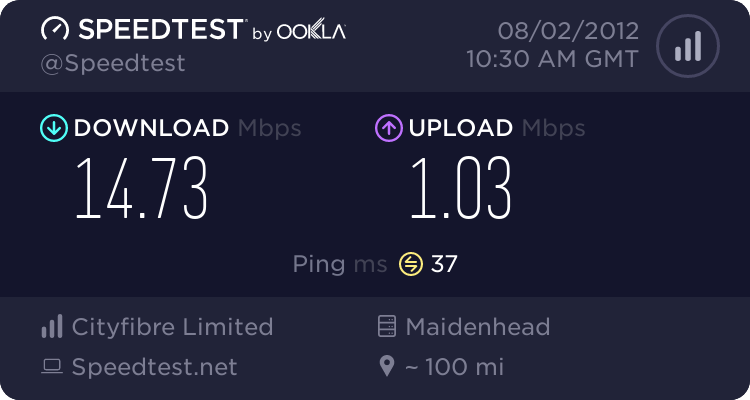 I am on my second Zyxel router now, after the first one completely died on me, and initially I had it connected to an extension socket upstairs. The trouble is it kept disconnecting constantly. So after speaking to customer support, I had to migrate the thing downstairs into the living room and connect it to the test sockect to get a stable connection. There it has stayed for the last month and a half/two months without dropping off once. Now apart from the fact that having the router in the living room isn't really practical, there is something that has been bothering me since I moved things around. During the interim time between the death of router number one and receiving router number two, I set up my trusty Billion Bipac 7800 upstairs to get by. For the whole time it was in use it never dropped the broadband connection once, so it came as a great disappointment to me, when I set up Zyxel router number two upstairs and it started playing up. The question I would love to know the answer to is why? Why did my Billion router work fine upstairs without issue, but the Zyxel router couldn't? Can anyone offer any theories because I just don't know. If you refer to the constantly disconnecting thread, you will see like many of us you have already found the answer � Cos it's rubbish! You Not Hiding your Light under a Bushel, Are you? The post (your post) to which you link does not address OP's Q. It's useless to OP. Possibly the Billion is relatively happy at the end of the extension and can handle interference with the adsl signal better than the Zyxel. Might be a good idea to connect the Billion at both locations, i.e. firstly at the test socket and secondly at the end of the extension, in order to test the relative qualities of both connections? The OP question was:- The question I would love to know the answer to is why? Why did my Billion router work fine upstairs without issue, but the Zyxel router couldn't? Can anyone offer any theories because I just don't know. So I would think that others found it is rubbish compared to the Billion is an easily understood answer � To some at any rate. Re: You Not Hiding your Light under a Bushel, Are you? Exactly! Others but not your post which makes no such point. No, But you obviously are! Were you lucky enough to be born stupid, or did you have to study? The link I gave, WAS TO ONE OF MY POSTS in another thread, where we were ALL discussing the poor PO router. Like the OP here, I had found the Billion much better and stated like me he had already found the answer, so just how out of context was that? Who was it that said a hobby borders insanity? Re: No, But you obviously are! Everybody is entitled to their opinion. No need to be aggressive. I never fire the first shot and always treat others as I feel they have treated me. A very good rule of thumb drummed into me many many years ago. Unfortunately, it often clashes with a sense of humor failure. Was there a ring wire to the extension, that may not have helped things. But finding one router copes with a line, when another does not is a very common thing. The software in each router is different, and thus how they handle noise spikes is very different. The billion may simply see the noise as an error and wait for it to go away, whereas zyxel twitch and resync in an attempt to find a better speed that may be more stable.